Conor McGregor marching in the Chicago parade last weekend. This time last week, Varadkar was somewhat overshadowed at the Chicago St Patrick’s Day parade, when the MMA fighter appeared at the event unexpectedly. 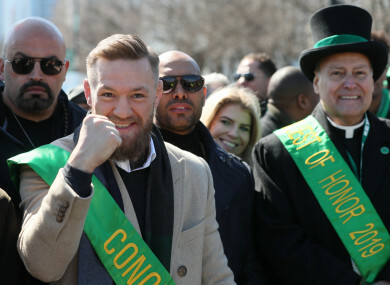 Government officials were left surprised when McGregor arrived to march in the parade, which he led alongside the city’s mayor, Rahm Emanuel. However, officials were not informed that the MMA star – who was charged with “strong arm robbery and criminal mischief” in Florida last week – would be appearing, saying that the decision was made by Emanuel’s office. Conor McGregor pleaded guilty to disorderly conduct, avoiding jail time, for his role in the UFC 223 media day fracas at Barclays Center in Brooklyn last year. When asked about the parade by reporters today at the Fine Gael National Conference, Varadkar said he was “happy to walk in the parade… I wasn’t specifically walking with him”. He denied that he went to great lengths to avoid walking next to McGregor, adding that the fighter just happened to be at the same event, an event which he and McGregor were invited to by the organisers. The Taoiseach was asked last week if it was appropriate that someone like McGregor is representing Ireland, given that he has been convicted of a crime. “It’s up to the organisers of the parade to decide who they want to march in the parade. I don’t think he was representing the country, that’s kind of what I was doing and Minister Ring as well. That’s why we’re here,” said Varadkar. Email “Taoiseach says he doesn't want to be associated with actions of Conor McGregor ”. Feedback on “Taoiseach says he doesn't want to be associated with actions of Conor McGregor ”.